SPEAR was recently pulled in by the recovery story of one of our dedicated patients, competitive sailor Glen Dickson. And we weren’t the only ones inspired to write about him; his recent sailing win at the 2015 Eastern E-scow championships was covered in a local upstate New York newspaper, the Jamestown Post-Journal. A deep and abiding love for sailing took hold of NJ native and freelance journalist Glen Dickson when he was little more than a toddler, and has kept him afloat ever since. 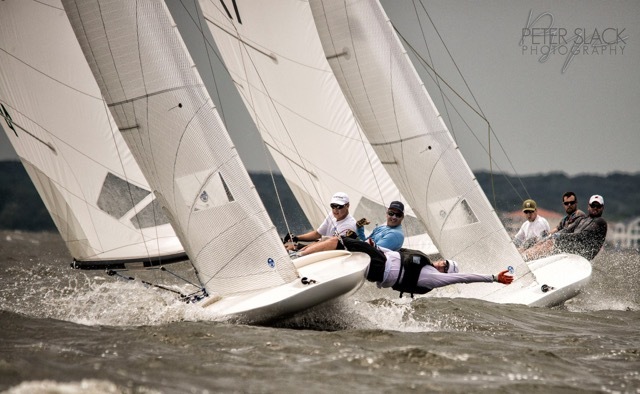 As a teen and an adult, he has raced both lasers (single-handed dinghies) and E-scows (flat-bottomed boats designed for 3-4 people) at the national level, even winning a national E-scow championship in 2010. The inevitable x-ray and MRI indicated a complete tear of his scapholunate ligament, an injury frequently seen in athletes (gymnasts, boxers) who cause trauma to their hands and wrists.Now in his forties, sailing is still a key element of his identity. So in April 2014 when he felt a pop in his left wrist during a practice sail, Glen brushed it off —taping the wrist, popping Aleve, and living with the pain. Glen Dickson, SPEAR and HSS patient who’s back to Championship sailing form. Having committed to race the summer season, Glen was eager to get his wrist back in sailing shape, but the odds were poor for a full recovery. One doc told him some 75 percent of scapholunate repairs fail, and that arthritis and significantly reduced range. A second opinion promised better range of motion, and Glen was prepared to sign on for surgery when his insurance changed. At this point, he had done a journalist’s research, and he knew what path to take. He sought the expertise of Dr. Steve K. Lee, Associate Attending Orthopaedic Surgeon at the Hospital for Special Surgery (HSS). HSS’s Dr. Lee, who developed the cutting-edge SLAM procedure and performed it on Glen. For several years, Dr. Lee had been performing a cutting-edge procedure called the SLAM method. It is similar to an anterior cruciate ligament (ACL) repair of the knee, using a tendon from the arm and a screw that Dr. Lee himself developed, plus two pins to keep everything in place while the tendon graft heals. Glen consulted with Lee, and to his great relief, the surgeon confirmed he was a candidate for the SLAM. He finally underwent surgery on January 7, 2015, and wore a cast for the six weeks following. Having his arm immobilized proved wearisome for the always active sailor. Once the cast was removed, Glen’s former PT from a previous shoulder injury introduced him to Phaeleau Cunneen, Certified Hand Therapist at SPEAR Physical Therapy’s 44th Street location. They began their work together, taking it slow due to the splint and the pins in his hand. Once the pins were out, Glen worked like an animal—three-four times a day—both with Phaeleau and at home. In Dr. Lee’s experience, dedication to recovery makes all the difference. Only one-third to one-half of all SLAM Axis patients experience full recovery. Only one-third to one-half of all SLAM Axis patients experience full recovery. Glen rehabbed with Phaeleau twice a week from March through May, always with his eye on the prize. He credits the therapists at SPEAR for keeping the therapy fun and positive, and surprisingly creative. For example, when Glen expressed to Phaeleau that he was worried about tearing his hands on the boat’s ropes, he suggested Glen bring in ropes to attach to the machines. Glen loved this idea. “I started showing him what I did on the boat. One of the things I do is I hoist the big spinnaker, pulling on a line really hard and fast. So we hooked up the ropes and at first I could only pull 10 pounds with my left hand on the rope. After getting the green light from Dr. Lee, Glen sailed again for the first time on Memorial Day, and played with his son in the ocean on the same weekend. He was rusty and weak, but happy to be back. By the end of July, he stopped therapy to avoid stretching the repair. The only reminder of the injury is a splint he wears when sailing. Aside from never putting weight on his open palm, Glen has no limitations in his everyday life. On Aug. 7, Glen sailed the boat Showtime in the 2015 Eastern Class E-Scow Association championship on Chautauqua Lake in Lakewood, NY. He and his crew were defending champs in what turned out to be a surprisingly hard regatta with an unusual easterly wind on the bay. “We did just well enough to win the regatta by one point,” Glen recalls. 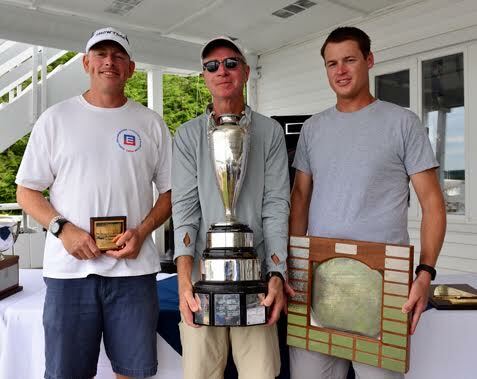 “We defended our title and our skipper [Erik Johnson] won his eighth title for the record. Glen and the crew of Showtime will compete again this month in the E-scow Nationals in Beach Haven, N.J. How does he see their chances this time? Given the way they’ve been racing this summer, he thinks they have a pretty good shot at the win. There is nothing to hold them back.